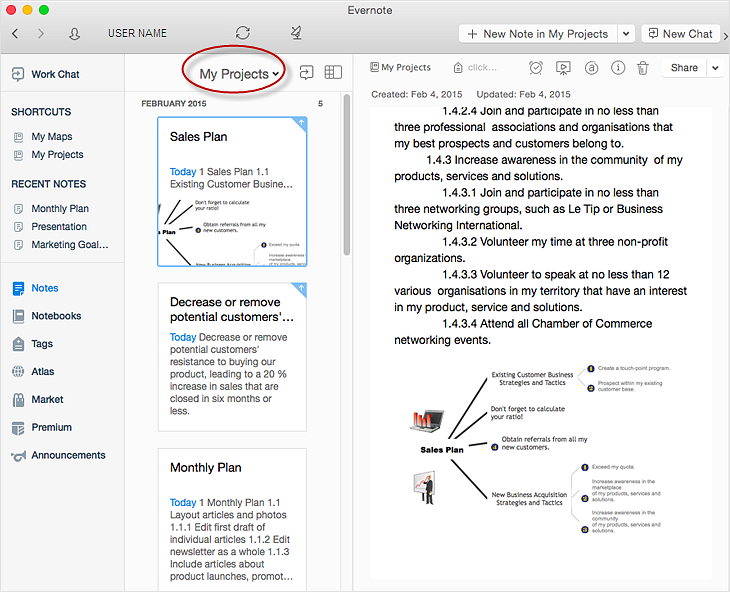 The Note Exchange solution lets you to publish content from ConceptDraw MINDMAP to your Evernote account. To use it, you need ConceptDraw MINDMAP and the Note Exchange solution installed. On Windows: Choose Settings from the Evernote button drop-down menu. Find it in the Share tab. On Windows: Choose a proper mind map option from the Evernote button drop-down menu. Find it in the Share tab. Your default email client will generate a message containing your mind map. To send the item to a particular notebook, append the subject line of email with the symbol “@Notebook name”. To add a tag, enter “#Tag name” to the subject line after the Notebook name. If sending emails to a recently created notebook or tagging with a recently created tag, remember to sync your account first. Result: You can organize and manage mind maps in your Evernote Notebooks making easier to share them with other Evernote users.